It’s a cloudy night, so sit back and let me tell you a story. In the Australian Outback there was a man and a woman who reached the age of life where finding their own food was becoming difficult. So they set up a camp because moving around and travelling was no longer an option at their age. The man’s camp was rather large and complex, while the woman’s camp was impressive, but not as big. They would meet by the fire to share the warmth of their older years. What? You were hoping for something a bit more uplifting? Doesn’t it make you want to be certain that older people are taken care of, and have enough food to eat? In case you forget, there is a reminder in the sky for you. 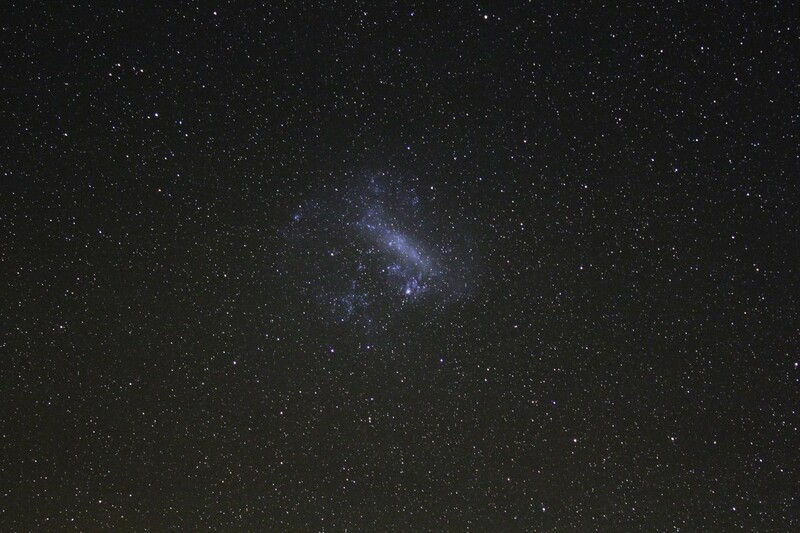 The Large Magellanic Cloud is the camp of the older man, and the Small Magellanic Cloud the camp of the older woman. Their celestial fire is the star Achernar. This is a story from Western Australia reminding all of us of our obligations to the elderly. 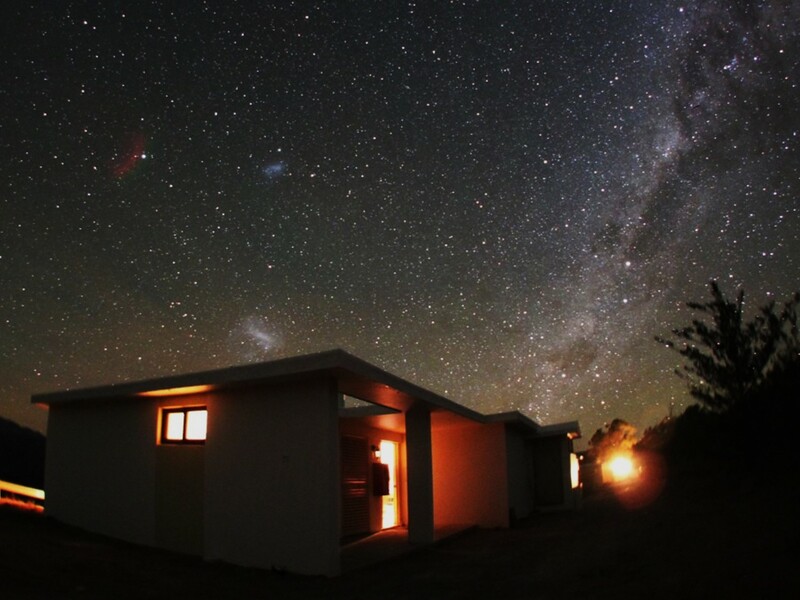 Large and Small Magellanic Clouds from dormitories at Cerro Tololo, Chile. The star Achernar (the campfire in the story) is seen to the left of the smaller cloud. The Large Magellanic Cloud, although considered irregular, shows hints of a barred spiral galaxy with an elongated core and traces of a spiral pattern at the edges. The color appears bluish, which is a testament to the abundance of cosmic dust and gas illuminated by hot, young blue stars. In other words, there is a lot of vigorous star birth happening here! Among the many super and hypergiant stars is one with the rather unromantic name of RMC 136a1, which is the 136th star in the Radcliffe Observatory Magellanic Cloud Catalog. This star is 265 x more massive than our star, and 8.7 million times more luminous; it has the highest mass and luminosity of any star we know. It is located in the Tarantula Nebula which is the most active starburst region known in the Local Group of galaxies, which is the Milky Way’s neighborhood. Let’s put it in perspective. If the Tarantula Nebula were some 1,600 light years distant from us (about the distance of the Orion nebula), it would be bright enough to cast shadows. Supernova 1987A erupted in the outskirts of this nebula. Spend some time here with binoculars or a small telescope. Current theories suggest that the nebula will eventually become a globular cluster, a ball of stars that will orbit the galaxy. There is some speculation that the Small Magellanic Cloud was in fact once a bar spiral galaxy as well. The Milky Way distorted it giving its current irregular shape. There is also some speculation that the cloud is in fact two galaxies and not one, just aligned in a way to give the perspective of being one galaxy. A bridge of gas between the large and small cloud indicates some tidal interactions between the two. The Small Magellanic Cloud is slightly farther away than its larger counterpart at 200,000 light years, and it boasts some several hundred million stars. 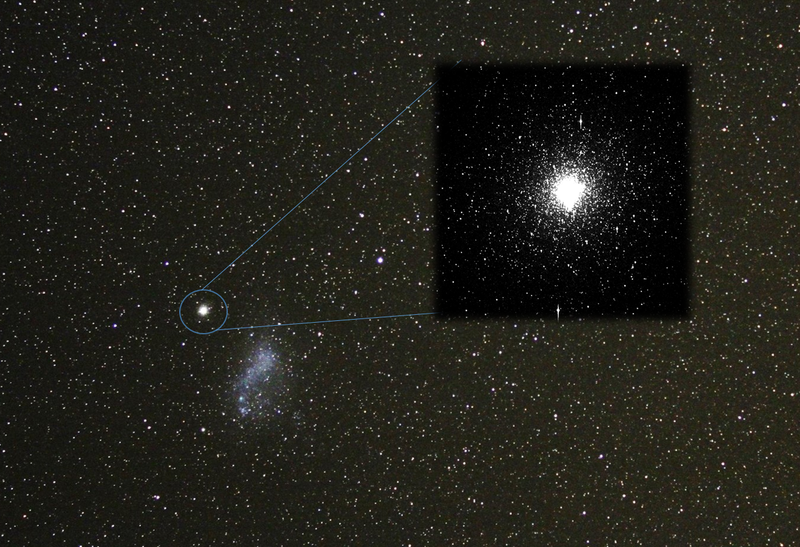 The bright star-like object nearby is not a star at all but a globular cluster, 47 Tucanae, a globular cluster. The designation means that it was bright enough to be thought of as a star on early star maps. The millions of stars that make up this globular cluster are located in our galaxy, and not the Small Magellanic Cloud, but its proximity is certainly worth a mention, and it is a beautiful binocular and telescopic object. Now sit back and gaze skyward at these beautiful southern clouds and let me tell you another story, this one from the Polynesians. There were two children who discovered one day that mom was actually a lizard. As cool as you would think this would be for two small boys to discover, they weren’t overly thrilled with their parentage. They decided to seek out Chief Maafu and live with him as his sons. The chief took them in, and named them Maafu toka and Maafu lele, but soon discovered that these boys got into so much trouble he simply had to do something! So he called them to him and asked them to fetch him water. One boy was sent to a pond where there lived a giant man-eating duck, and the other was sent to a pond where there lived a huge man-eating parrotfish. Yeah, it was a bit extreme, and I’m certain the chief felt a bit guilty about the assignment as they left. But imagine how confused he was when they both returned carrying a slain gigantic duck and parrotfish! The chief gave up and simply sent the boys away with their duck and parrotfish. To this day you can see where they ascended into the sky as two huge clouds. At least this way the chief could watch them at night from a distance and smile. And so can you; explore the amazing wonders of these cloudy nights!